Colombian cuisine is a compound of the culinary traditions of the six main regions within the country (Pacific, Amazonian, Andean, Orinoco, Caribbean, and Insular). Colombian cuisine varies regionally and is particularly influenced by Indigenous Colombian, Spanish, and African cuisines, with slight Arab influence in some regions. Furthermore, being one of the most biodiverse countries in the world, Colombia has one of the widest variety of available ingredientes depending on the region. Colombia's varied cuisine is influenced by its diverse fauna and flora as well as the cultural traditions of the ethnic groups. Colombian dishes and ingredients vary widely by region. Some of the most common ingredients are: cereals such as rice and maize; tubers such as potato and cassava; assorted legumes; meats, including beef, chicken, pork and goat; fish; and seafood. Colombian cuisine also features a variety of tropical fruits such as cape gooseberry, feijoa, arazá, dragon fruit, mangostino, granadilla, papaya, guava, blackberry, lulo, soursop and passionfruit. Bandeja paisa from Peñól de Guatapé in Antioquia, Colombia. Among the most representative appetizers and soups are patacones (fried green plantains), sancocho de gallina (chicken soup with root vegetables) and ajiaco (potato and corn soup). Representative snacks and breads are pandebono, arepas (corn cakes), aborrajados (fried sweet plantains with cheese), torta de choclo, empanadas and almojábanas. Representative main courses are bandeja paisa, lechona tolimense, mamona, tamales and fish dishes (such as arroz de lisa), especially in coastal regions where suero, costeño cheese, kibbeh and carimañolas are also eaten. Representative side dishes are papas criollas al horno (roasted Andean potatoes), papas chorreadas (potatoes with cheese) and arroz con coco (coconut rice). Organic food is a current trend in big cities, although in general across the country the fruits and veggies are very natural and fresh. Representative desserts are buñuelos, natillas, torta Maria Luisa, bocadillo made of guayaba (guava jelly), cocadas (coconut balls), casquitos de guayaba (candied guava peels), torta de natas, obleas, flan de arequipe, roscón, milhoja, and the tres leches cake (a sponge cake soaked in milk, covered in whipped cream, then served with condensed milk). Typical sauces (salsas) are hogao (tomato and onion sauce) and Colombian-style ají. In the city of Medellín, the typical dish is the bandeja paisa. It includes beans, rice, ground meat or carne asada, chorizo, fried egg, arepa, and chicharrón. It is usually accompanied by avocado, tomato, and special sauces. In the city of Cali, the most traditional dish is "sancocho de gallina" - a soup composed mostly of chicken, plantain, corn, coriander, yuca root, and other seasonings. Sancocho is usually served with a portion of rice, tostadas (fried plantains), and a chicken leg covered in hogao (a tomato and onion sauce). The city is also known for its empanadas (a fried corn dough filled with potatoes and meat), marranitas / puerquitas (a fried ball of plantain filled with chicharron, also known as pork rinds), pandebono (a delicious cheese bread made with yucca dough), and aborrajados (sweet ripe fried plantains filled with cheese and served with guava paste). In Bogotá and the Andean region, ajiaco is the traditional dish. It is also a type of soup made of chicken, potatoes, and flavoured with a locally grown herb called "guasca". In the Caribbean coast, spicy cooking, with fish and lobster, is practiced. Coconut rice is a common dish along the coastal cities. The cuisine of the Caribbean is also influenced by Arab traditions, with dishes such as Kibbeh. In the Llanos, meat from the barbecue, such as the "ternera llanera" is common, and also typical river fishes like the "amarillo". In the Amazonas, the cuisine is influenced by Brazilian and Peruvian traditions. Inland, the dishes reflect the mix of cultures, inherited mainly from Amerindian and European cuisine, and the produce of the land mainly agriculture, cattle, river fishing, and other animals' raising. Such is the case of the sancocho soup in Valledupar, the arepas (a corn based bread-like patty). Local species of animals like the guaratinaja, part of the wayuu Amerindian culture. In the Andean region of Nariño, traditional dish is broiled guinea pig (cuy asado), due to influence of inca cuisine. In the Tolima region, the Tamales Tolimenses are a delicacy. These tamales are made of a corn dough and feature peas, carrots, potatoes, rice, chicken, pork, and various spices. They are wrapped in plantain leaves and boiled for three to four hours. Pandebono for breakfast with hot chocolate. On the Islands of San Andres, Providencia, and Santa Catalina, the main dish is rondon, a seafood dish made of coconut milk, fish, conch, cassava root (yuca), sweet potato, white yams, and pumpkin seasoned with chili peppers and herbs. They also have a crab soup which is considered a delicacy. It is made with the same ingredients as rondon, without the fish. Piqueteaderos are rustic eateries that serve a variety of fried foods and specialties in platters to share. Offerings can even include huesos cerdos (pig bones), tarta de seso (brain pie) as well as fried dishes, morcilla, corn on the cob, and other Colombian delicacies. Colombia is home to numerous tropical fruits that are rarely found elsewhere. Several varieties of banana include a very small, sweet version. 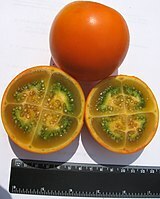 Other Colombian fruits include zapote (Quararibea cordata), nispero (Manilkara zapota) lulo (Solanum quitoense), uchuva (Physalis peruviana), papayuela (Vasconcellea pubescens), passion fruit, borojó (Borojoa patinoi), curuba (Passiflora tarminiana), mamoncillo (Melicoccus bijugatus), guanábana (Annona muricata), guava (Psidium guajava), tomate de arbol (tamarillo), noni (Morinda citrifolia). More widespread fruit varieties grown in Colombia include mango, apple, pear, blackberry, and strawberry. Arroz con Pollo, consists of seasoned rice, chicken, and a variety of vegetables. 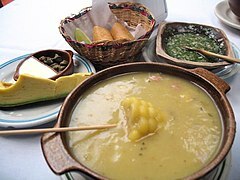 Ajiaco is a traditional Andean dish that originated from Bogotá. It is a chicken, corn, and potato stew with a hint of guasca (Gallant Soldiers), a local herb. Bandeja Paisa, a traditional dish from Antioquia and the "Eje Cafetero" which consists of white rice, red beans, ground beef, plantain, chorizo, morcilla, chicharron, arepa, avocado and a fried egg. Along with Ajiaco, the bandeja paisa is considered to be one of the national dishes. Cuchuco, a thick soup made of wheat, fava beans, potatoes, ribs, peas, from Boyacá. Cuy asado, broiled guinea pig accompanied by potatoes and popcorn. It is the traditional dish in Nariño. Mondongo, a thick tripe soup. Picada Colombiana, chopped specialties served as a combo platter. Sancocho, is a popular soup originating from the Valle del Cauca region. It combines vegetables and poultry or fish with recipes differing from one region to the other, but usually contains yuca, maize, and is frequently eaten with banana slices. Tamales are corn or corn/rice “cakes” wrapped in platain tree leaves and steamed. They can be filled with everything from chicken, potatoes, peas, carrots, to rice. The tamales vary in shape and fillings in each region, and almost every region has its own variation. Some well known variations are from Tolima, Santander, Cúcuta, Bogotá and Valle del Cauca; just to name a few. Fritanga is another popular Colombian dish made of meats, fried plantains, chicharrones, and yellow potatoes with aji sauce eaten throughout Colombia. 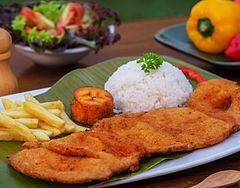 Milanesa is another common meat dish throughout the country. 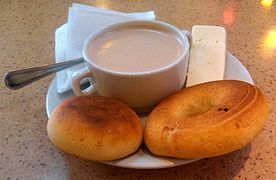 Changua (milk soup with eggs) is a typical breakfast soup of the central Andes region of Colombia, in particular in the Boyacá and Cundinamarca area, including the capital, Bogotá. The dish has Chibcha origins. Caldo de costilla (Spanish for rib broth) is a dish typical of Colombian cuisine, from the Andean region. It is made mainly from beef ribs boiled in water with slices of potato, some garlic, onion and cilantro leaves. Locro is a typical dish in Nariño region. It is a corn, beans, zapallo and potato stew. Arroz con leche (Sweetened rice with milk). Brevas en dulce - candied figs in syrup or arequipe. Cocadas - baked coconut confection, similar to macaroons. Ice cream is quite popular in Colombia, including many made with local fruits and regional flavors. Leche asada, similar to flan but less sweet, made with condensed milk. Manjar blanco a boiled, creamy, milk-based spread, thicker than arequipe and sometimes used as a pastry filling. Melado, a thick syrup derived from panela. Merenguitos, little hardened meringue "cookies"
Natilla, a Colombian derivation of the Spanish custard natillas, made with milk and cornstarch and spices but without eggs. Postre De Natas, a cream-pudding made with flour, eggs, vanilla, lime, and raisins. Ajiaco soup is typically served with table cream, capers and avocado, mixed in just before eating. Fried Red Snapper, fried plantain, rice and tomato. Patacones are twice-fried plantain patties, often served as a side, appetizer, or snack. Here they are being fried for the second time. On a per capita basis, Colombia is one of the world's largest consumers of fruit juices, consuming on average more than three quarters of a serving each day. Aguapanela is made by dissolving panela (a kind of sugarloaf) in water. Lime juice may be added for flavor. It can be served cold or hot. When served hot it is common for Colombians to put cheese in their aguapanela for it to melt. Champús is a thick drink made from corn, pineapple, lulo, and other ingredients. Hot chocolate, Colombian hot chocolate is made with milk, water, and bars of semi-sweet chocolate. A special metal pitcher (called a chocolatera) is used for heating and pouring, and a utensil called a molinillo – essentially a stick with paddles at the end – is used for stirring and frothing. Colombian hot chocolate often includes cinnamon, cloves and vanilla. Colombian coffee is known for its quality and distinct flavor. Though much of the world's quality coffee beans come from Colombia, many Colombians commonly drink instant coffee rather than brewed. It is popularly consumed as a "tinto", meaning black with sugar or panela on the side, or as café con leche, which is a preparation of half coffee and half heated milk. In 2011 UNESCO declared the Coffee Cultural Landscape of Colombia a World Heritage site. Guandiolo is an Afrocolombian drink made with Borojo fruit that has alleged aphrodisiac properties. 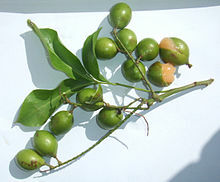 Lulada is a drink originating from Cali. It is prepared from lulo and has the texture and consistency of a smoothie. Malta: Carbonated malt non-alcoholic beverage (genericized trademark). Salpicón (which literally means large splash) made from diced fruit and soda, usually Colombiana or any Kola flavored soda. It can also be a fruit cocktail beverage (often made with watermelon or mandarin juice). Colombian coffee is known for its quality and distinct flavor. Aguardiente is an alcoholic drink derived from sugarcane and flavored with anise. It is widely consumed at Colombian parties, and ranges in potency from 20% to 40%. It is a variation of the Spanish alcoholic drink. Biche is an alcoholic drink of afrocolombians made up with unripe sugarcane. Canelazo is an alcoholic version of aguapanela mixed with cinnamon and aguardiente. Sugar is rubbed on the edges of the glass when served. Hervido is a local variety of canelazo, traditional in Nariño. Chapil is a traditional beverage in Nariño. Chicha is a formerly forbidden strong alcoholic beverage originally made by the indigenous peoples of the Andes. It can be prepared from virtually everything, but is typically made from corn. The corn is cooked and grounded with panela which is later wrapped in green plantain leaves and left alone for three days until fermented. It is later mixed with water and any chosen flavors such as orange leaves or spearmint. Guarapo is made from various fruits kept in a large ceramic jar and left to ferment for about 2 months. Within that time, panela is added into the liquid to make the alcohol stronger. Grapes and pineapple are typically used. Guarapo is very similar to Chicha. Masato, It is prepared with rice, sugar, water, cinnamon and whole clove (spice); It is strained and the water is preserved and let aside to have a smooth fermentation. Refajo is a type of shandy beverage made by mixing Kola Hipinto (in santanderian region), Colombiana (in cities like Bogota) or Kola Roman (in the Caribbean region), with beer or rum. This mixture of soda and beer is very popular and seen a lot when it comes to accompany foods that are higher in animal fat, generally at barbecues. The combination of the sweetness of the kola and the sourness of the beer and the additional effect of the carbonated soda helps tolerate the fat of some of the typical dishes without hiding their original flavor. Sabajón, a sweet and creamy alcoholic drink from the Cordillera Oriental. It is made from eggs and milk with added flavors and juice of fruits and liqueur on half or less concentration. Wikimedia Commons has media related to Cuisine of Colombia. ^ "Colombia". EveryCulture.com. Retrieved 2018-07-01. ^ "The lasting influence of Colombia's African heritage". Colombia.co. Retrieved 2018-07-01. ^ "A Cheat Sheet to Colombian Food". Eater. Retrieved 2018-11-30. ^ "Typical Colombian Food". Retrieved 30 October 2013. ^ "Colombian Food: Variety, Tradition and Nature Fruits". going2colombia.com. Retrieved 30 October 2013. ^ "Colombian Food; A List of Traditional and Modern Colombian Recipes". southamericanfood.about.com. Retrieved 30 October 2013. ^ "Colombian desserts". uncovercolombia.wordpress.com. Retrieved 30 October 2013. ^ "10 Colombian Drinks You Must Try Before You Leave". Retrieved 30 October 2013. ^ Colombia Travel. "Jugos naturales" (in Spanish). Retrieved 11 July 2013. ^ Erica Dinho (2009-02-17). "Fruit Cocktail (Salpicón De Frutas)". My Colombian Recipes. Retrieved 2013-07-11. ^ "Chicha". Colombia.com. Retrieved 2016-10-23. ^ "Masato". Colombia.com. Retrieved 2016-10-23. ^ "El refajo". www.semana.com. Retrieved 2016-10-23.